We are so lucky to welcome Dr. Margot Savoy to Georgetown for our September Grand Rounds. Among many other things, Dr. Savoy is the Medical Director of the Christiana Care Health System Department of Family & Community Medicine in Wilmington, Delaware. She is very passionate about Vaccine Science and serves on several regional and national committees on immunizations, including The Advisory Committee on Immunization Practices (ACIP), which is a group of medical and public health experts that develops recommendations on the use of vaccines for the US population. I wanted to know a little bit more about Dr. Savoy beyond her CV. Mishori: You were once the American Academy of Family Physicians’ (AAFP) “Vaccine Fellow”. What does that mean? What did you do? Mishori: You are known to always wear pearls, even while hiking on vacation. Why? Savoy: Pearls are classy and go with everything! 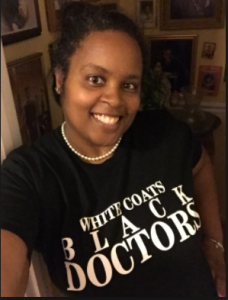 They also serve as a constant reminder to me of the commitments I made as a member of Delta Sigma Theta Sorority, Inc.
Mishori: There is a long alphabet soup of credentials after your name: MD, MPH, FAAFP, FABC, CPE, CMQ, FAAPL. That’s a lot! Can you tell us about what each one means? Savoy: I know you know what MD, MPH are already so I’ll skip those. FAAFP signifies that I’m a fellow of the AAFP. It is an honor any established member of the Academy can apply after you have provided a certain number of years of service, leadership and membership activity. FABC is the designation I received after finishing my mini-MBA/healthcare leadership fellowship with the Advisory Board Company. We spent a year learning about healthcare management, politics and finances and how to practically apply them to our roles back home. CPE means I’m a board-certified physician executive. I completed a certain level of education, achieved milestones in physician leadership and passed a combination written and oral exam. CMQ means I’m board certified in medical quality. I’ve got an advanced degree, practical experience in quality and passed a written exam. Last but not least FAAPL means I’ve made enough noteworthy contributions to physician leadership field that I was recognized as a fellow for the American Association of Physician Leaders. Mishori: What’s your advice to medical students? Savoy: My advice to medical students usually begins and ends with choosing the specialty and location that bring you joy. It’s hard work being a physician. Often days can be long and sometimes they can even feel unrewarding. If you choose a specialty you love and a setting to practice where you enjoy, even on your toughest day you will easily find people and moments to be grateful for. I love my family medicine family and if given the chance all over again I would have chosen Family Medicine all over again. Mishori: Finally, what’s so grand about Grand Rounds? Savoy: :Grand Rounds are an opportunity to hear another perspective from outside of your comfort zone. Sometimes you will agree and sometimes not- but either way you will be thinking critically and assessing the topic put before you. The time to slow down and think deeply on a topic is a grand gift! If you want to know more about Dr. Savoy, you can see her full bio here https://doctors.christianacare.org/details/1959. This entry was posted in Uncategorized on September 3, 2017 by Ranit Mishori.